RAIRO-Operations Research is an international journal devoted to high-level pure and applied research on all aspects of operations research. All papers published in RAIRO-Operations Research are critically refereed according to international standards. Any paper will either be accepted (possibly with minor revisions), submitted to another evaluation (after a major revision) or rejected. Every effort will be made by the Editorial Board to ensure a quick turnaround on all papers submitted to the journal. Articles may be written in English or in French. 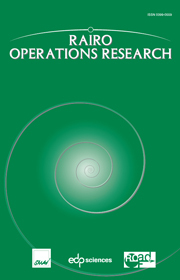 RAIRO-Operations Research contains the following types of papers: * theory and methodology papers; * case studies describing the solution to an actual problem arising, for example, in Transports, Telecommunications, Production Systems, Financial Planning, Computational Biology, Energy or Computer Science; * state-of-the art surveys that provide a synthesis and comprehensive review of one particular area of interest.